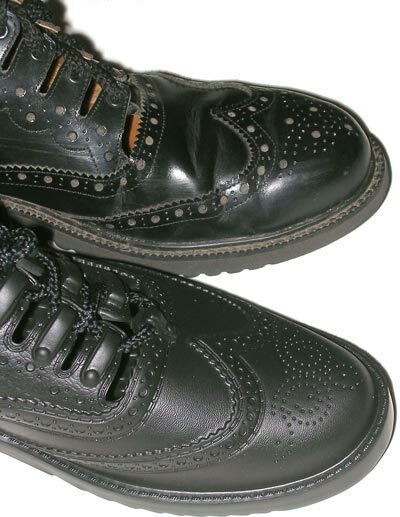 In October 2009, a new alternative ghillie brogue sprang on the market. Ghillators, invented by Jeff Anderson, can be summed up in three words: Ghillie Brogue Crocs. (For the few who don’t recognize the brand name “Crocs”, they are those molded synthetic vented shoes which have hit it big in in the last few years.) Anyone who has worn ghillie brogues is aware that they typically range from tolerable to painful. And we’ve all experienced firsthand or heard the horror stories about the blistered feet after a long highland games or parade. Jeff Anderson is no stranger to the pipe band scene. He’s a SUSPBA adjudicator and also chairs the SUSPBA Music Board. He also has been the SUSPBA delegate for the music initiatives committee of ANAPBA and has participated in at least five ANAPBA summits, including two hosted by WUSPBA in 2007 and 2011. Driven by personal experience of wearing brogues in foul weather only to have them fall apart or wearing other very uncomfortable pairs, he figured it was time for another option. I asked Jeff about his inventive spirit. “I am a pharmacist and formulated an antimicrobial pipe bag seasoning for hide bags years ago. However, I never really advanced with the concept or marketed my idea because synthetic pipe bags seemed to monopolize the market. I did not see strong market potential. However, Ghillators are a different story. The shoes currently retail at “an introductory price” of $49.95, compared to $80 or more for a traditional pair. I had high hopes for the comfort factor but I was mostly concerned about the appearance since the photos on the Ghillators website were rather dark and small. I ordered a pair of Ghillators in October and they shipped from Florida to California in 2 days via U.S. Priority Mail. The box arrived surprisingly light. I gave a shoe to my 11-year-old daughter Charlotte to hold in her hand and her response was “Wow! Those are light!” (A digital scale backs that up, they weigh less than half the weight of even a light-weight true ghillie brogue.) She also told me that they smell like Crocs; she would know since she had such a pair. It’s not a bad or strong smell, just the type of odor. The Ghillators are ever so slightly lighter in color than expected, just a touch more gray than a saturated black, but it’s not particularly noticeable. They are also more matte and do not have the polished look; this is more apparent. The laces pass through the shoe in a significantly different manner than a typical brogue. The laces don’t pass from below like a typical shoe, but pass horizontally through a tiny “block.” But again, without looking close, it’s not going to be noticed. Considering that back in my early days I never had a judge comment on my black walking shoes with the tongue cut out, you are going to be very safe at a competition with these! Again, at a glance no one will tell the difference. Ghillators at a glance are almost indistinguishable from a traditional ghillie brogue. While I didn’t have a highland games or parade to attend, I did wear the shoes around the house for about eight hours. Not quite as comfortable as slippers but dramatically more easy on the feet than a typical ghillie brogue shoe. Yes, these shoes are comfortable. One thing that was unmistakable is that your feet will sweat more in these polymer shoes. For the vast majority of people this will not be a concern, but, as was pointed out to me, some pipers have skin problems which might keep Ghillators from being a good choice. The Ghillator website warns of pulling the laces tight. I read online that a piper in New Jersey gave the laces a good yank and broke the top lace holder, so there is a good reason for the warning. A gentle hand is required. If I were to play in foul weather or was expecting mud, there’s no question which pair of shoes I’d grab. Ghillators you can submerge in the kitchen sink, scrub with a sponge and throw on a drying rack. That said, personally, I wouldn’t wear them with a Prince Charlie outfit. As for a games on a nice day, it depends if you want that incremental improvement in shoe appearance. The Ghillators are almost certainly going to be more comfortable than what you’re used to. So, bottom line? Downsides: matte finish, somewhat sweaty feet, have to take it easy when tying, sizing can be an issue. Upsides: incredibly light, comfortable, super easy to clean, inexpensive. This page last updated Friday, March 25, 2011. Page first created in January 2, 2010.